There are only a few Ewoks in the TV movies who weren't in RotJ. Lydeen is one of them. 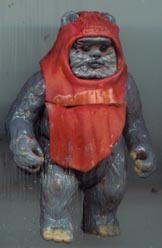 He used to be Willy - which Hasbro made in the Endor Ultimate Battle Pack, only they called him Wicket for some reason. As you can see, I had to reglue on his bib, which I still had all these years later.